Hard to find Spalding AXP World Series Model Firstbase mitt. Soft leather with rolled leather piping. Lining with a little and still feels fine in your hand. Tough model to find. Glove stand not included. Vintage 1900's Baseball Glove by James Brine Co. # RG230. Shipped with USPS Priority Mail. Sweet early baseball with green stitching. Vintage framed 1900’s football team photo. Great content showing an African American player and a melon football. The photo is very very good overall condition. Spectacular 23” x 18” photo. Check my other cabinet/ team photos. Leather trim on this model and the leather in general is soft. Tough model to find in this condition. Glove stand not included. The glove displays nicely as is, but also would be a restoration candidate. A.J. REACH CATCHERS MITT. GREAT COLLECTABLE PIECE! PRESENT AND A LEATHER STRING FOR THE. ANTIQUE YOUTH. WEB AREA IS NOT PRESENT. HAS STORAGE ODOR. EVERYTHING SEEMS. In most cases problems or concerns are easily resolved. Youth size Mitt. Small, Youth size Glove. antique, Baseball Glove with a Great look! 8 1/2" tall & 8 1/2" wide. perfect Display! small fray spot at web/split finger. not very bad at all. Brown, Genuine Leather palm side. Wrist strap is still intact. Very large thumb. Nice example of the fourth generation baseball glove. Baseball Glove Catchers Mitt Boston Mass. Super soft leather on front and back.Nice, visible Spalding Logo Patch. Buckle strap is complete. IT IS IN EXCELLENT CONDITION FOR ITS AGE WITH THE WEB INTACT. THE LEATHER IS STILL FAIRLY SUPPLE FOR ITS AGE. I do not know the actual year and cannot make out the original maker. Makes a very nice display piece. Pictures are of the actual mitt being sold. ✓ Sales are AUTHENTIC & LEGITIMATE. Nice Old Estate purchase. 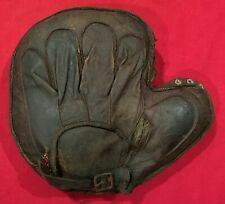 Early 1900s base mitt crescent back with wrist buckle. Previous owner seems to have restrung the leather cord. Inside palm leather padding is worn out. No maker label but there is a faint silver name that looks like Lefty Trimm but can’t make it out. I thought it may be a player store model glove but research has gone nowhere. Feel free to ask questions and I will help all I can. Vintage baseball glove. Nice crescent pad at the bottom.Great patina. Nice piece from yesteryear. Glove has been used shows use and wear. Not mint. Nice buckleback example. Circa early 1900's . Youth Size. Glove would make a Great early Baseball display piece. & Back of Glove is a Heavy Canvas material. Palm of Glove is Dark Brown, Split-Leather/Suede. easily repaired. Turn of the Century Ca. 1890s 1900s Spalding Tag Baseball Glove Mitt 8" x 8". Please look at photos to see condition. Leather is nice on front side, back side on thumb is fragile. Very early Spalding Bros glove with tag label intact, faded as shown in picture. Great basement find. Great display piece. Shipped with USPS Priority Mail. Extremely rare knockdown baseball glove in EXCELLENT condition considering age. In actually fantastic condition overall and solid not fragile. The pads are all still good and not brittle at all. All the welds are solid. I'm not expert. Vintage baseball glove. Great patina. Nice piece from yesteryear. Glove has been used shows use and wear. Not mint. Nice buckle web example. Horse hair catchers mask. Very rare. Small antique baseball glove. Inside appears to be white kid leather. Outside is cloth with some repair. My dad purchased this from a dealer in Cooperstown in 1994. Pictures are a bit deceiving as the gloves appears to be full size but is not. These pads are in very good condition for there age. Circa Early 1900's, Draper & Maynard, Full Web, White Baseball Glove, EX Cond. Very soft leather and overall condition is excellent. Original wrist button is also present. Early 1900's Leather Men's Cap-Baseball?Football? Unknown exactly. There are 3 closable open buttons?. on each side of cap. Nice tunnel loop flap in between thumb and index. 9" x 9" - Great Display Piece! Vintage Antique Old 1900 Baseball Belt Ball Gr Thread Hand Woven. Sweet early baseball with red stitching. Nothing pulling apart. The glove is in a different listing. Also see my other listings for gloves and memorabilia. Vintage Antique Old 1900 Baseball Belt Ball Green Thread Hand Woven. Sweet early baseball with green stitching. Nothing pulling apart. Looks like an early identification on the sweet spot. The glove is in a different listing. Also see my other listings for gloves and memorabilia. Classic collectible baseball mit perfect for the man cave. There are words on the mitt I cannot make out so I don't know the brand or any specifics, it's just cool. I've had it for years now it's time for someone else to enjoy. I've seen similar gloves auction for a lot more then my price. This may very well be a steal for someone!